This is what happens when you add an XML file from realtime reflections, to textures in the Grafon low quality hi-res textures with a corresponding "blue" Normal.png next to it. You can rename these things, and switch them around. From dungeon walls, to the floor of an inn. The future of DFU architectural textures ? p.s. you need to edit the xml file to get these results - set smoothness to 7, metal just makes it a bit darker (wet) so 2 is pretty much good for the metal. Notice the wood for the small table. All the wood in my game looks like this now, even door frames, and that roof over the exit for the towers on castle walls, the beams on vaulted ceilings, even the wood posts for houses. Big rooms are where this thing really shines. If it's this new stuff from Grafon-master (Igor), set the metal to 1 or 2, and smoothness to 7 (that's the key thing here, the smoothness). This stuff will lag your stuff tho so be advised. 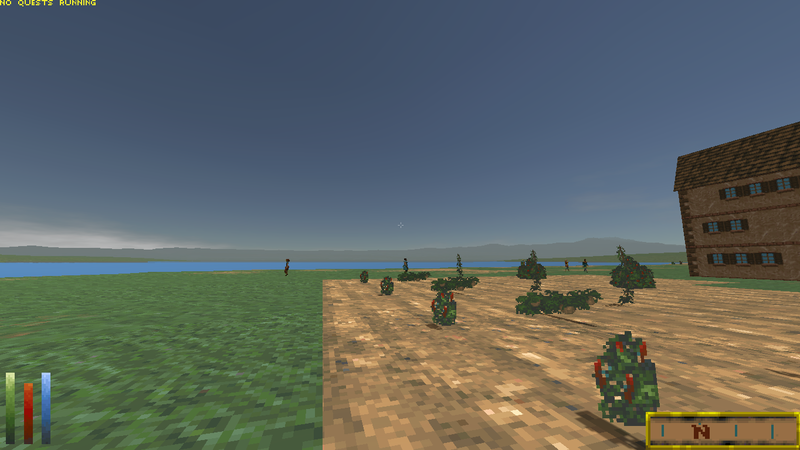 username wrote: Looking north at Kingsly Orchard in The Isle Of Balfiera, using Distant Terrain mod. :O where can i find the distant terrain mod? Feelings are deceitful. I am sure I'm not the only one lurking, watching and being overwhelmed by the progress made on this project. Since I have nothing to add myself, I do not post, but know this: I really like what you are doing. One thing perhaps, in your upscaling project... it's just a suggestion. I think you are going for unnecessarily high resolution. For the purpose of working on the images it might be beneficial, but the final sprite could be much smaller I think. If for no other reason, at least for the sake of performance.